Please, don't touch the screen. : Can you actually drive with your engine off? This is one of the recurring questions about hybrid cars. Using Torque, I collected some data about my daily commute from home to work and back. Here is one trip, from work to home. 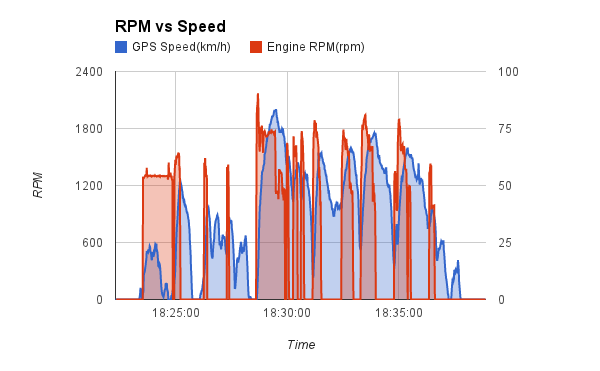 Engine rpm are drawn in red: when the value is 0, the engine is off. Veicle speed is blue: where speed is greater than 0 and the engine is off, we're moving with the electric motor. Engine is off 55% of the time. By comparison, in the trip from home to work, the engine is off 46% of the time. 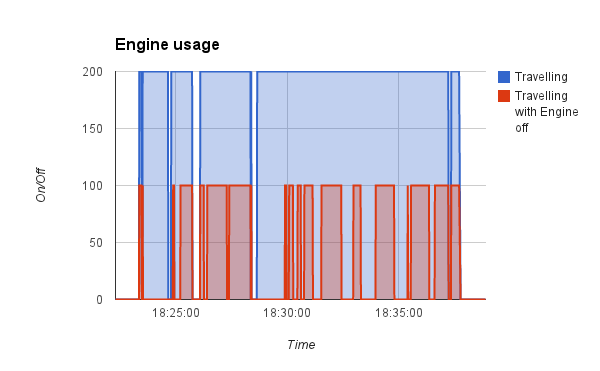 On the average, in my daily trips, the engine is off 50% of the time.